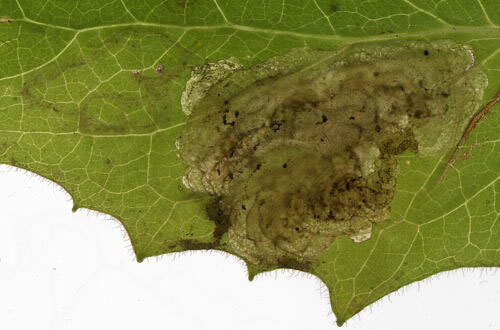 Leaf-mine: Elongated upper-surface blotch, preceded by a corridor (exceptionally, visible in the picture, as a long lower-surface corridor). Primary and secondary feeding lines conspicuous. Older mines quickly turn brown. Pupation outside the mine (Bladmineerders van Europa). Described by de Meijere (1925a) and Beiger (1960b, as mycelis); front spiraculum with 9, rear spiraculum with 3, equally sized, papillae (Bladmineerders van Europa). Described by Beiger (1960b, as mycelis) (Bladmineerders van Europa). Time of year - mines: June-July; August (British leafminers). Distribution in Great Britain and Ireland: UK (Godfray, 2011), Norfolk (James Emerson, pers. com.) and Yorkshire (British leafminers).